Commenting on a BBC study, which claimed that the Taliban is still openly active in 70 percent of Afghanistan, Shuja Nawaz, Distinguished Fellow at the South Asia Center of the Atlantic Council, told Sputnik about the chances of beating this militant group. Sputnik: Some experts have said that Trump’s comments suggest that he sees a military victory over the Taliban, do you think this is likely? Shuja Nawaz: The military doctrine has not been defined by anyone so we don’t know what the criteria will be that will be applied to victory in Afghanistan. We had much reduced the US presence and even with the mini-surge, it’s not going to be more than a fraction of what a total of 150,000-odd US and coalition forces were at the peak. So it’s not clear what it is meant by a military victory. The only change that has occurred is the fact that for the first time the United States is not declaring any date for exiting the country. That is what deepened the Taliban engaged in the fight because the principal demand is that the United States and coalition forces should leave Afghanistan and that demand has been satisfied with the fact that the US is now staying there indefinitely. Sputnik: What can you say about the effectiveness of the US policies and what do you think is their aim in currently keeping their presence in the country? Shuja Nawaz: This has been the issue of the US war in Afghanistan, the so-called forever war. The aims have been shifting overtime and it’s not clear what the aim is this time. If the aim is to restore the sovereignty of the Afghan government and to assist in providing governance of overall territory, then that it can only be done by working with the Afghan government and the regional governments. And the regional part of the American strategy is not yet fully articulated. There is very little effort, for instance, to draw Iran into the process because if you look at the map, a substantial proportion of the territory Taliban controlled and even the ISIS (Daesh) is in the Iranian sphere of influence. It is not bordering Pakistan. So there’s a need to bring Iran into the process and Iran would want a stable Afghanistan on its border so it can also prevent the outflow of narcotics into Iran which has been initially prevented. Russia needs to be involved [because] it has expressed its desire to be a partner in this process and it has actually hosted some meetings [on the matter]. China needs to be involved because it has huge investments in Afghanistan and also has partnership relationship with Pakistan. The views and opinions expressed by Shuja Nawaz are those of the speaker and do not necessarily reflect Sputnik’s position. 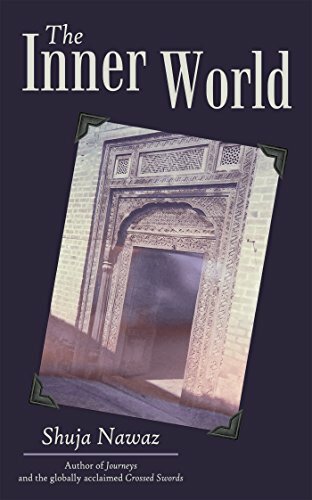 Let Shuja Nawaz take you into The Inner World, a poetic travelogue enriched by a lifetime of discovery across the globe, and introduce you to the people and places that inform this delightfully rich trove of imagery and wordplay. A fitting follow-up to his earlier highly treasured Journeys, this volume will entice and enthrall you. Shuja Nawaz takes you behind the scenes of his own life as a world-renowned strategic and security analyst and advisor of civil and military leaders in the United States, Europe, and South Asia. These poems will surprise and excite you. On January 4, the United States announced the suspension of nearly all security-related assistance to Pakistan until Islamabad could prove its commitment to fighting terrorism and cut its ties with militant groups such as the Taliban. This decision came just days after U.S. President Donald Trump had accused Pakistan, on Twitter, of giving “safe haven to the terrorists we hunt in Afghanistan.” Pakistani leaders responded with a familiar refrain, claiming to have moved against all militant groups without distinction and pointing to the enormous costs in terms of money (over $120 billion) and lives (nearly 80,000 civilian and military dead) sustained by Pakistan in the fight against terrorism since 2001. For Trump, it may feel good to vent his frustrations about Pakistan, especially now that his administration is desperate to salvage something from the United States’ prolonged and losing conflict in Afghanistan. These new sanctions, however, are unlikely to influence Pakistani behavior, which is rooted in realities on the ground that the United States has little ability to change. Pakistan is a complicated country in a tough neighborhood. Its main strategic concerns are to contain the surging power of its neighbor and rival, India, and to combat Islamist militancy inside its own borders—in particular, it wishes to fight the Pakistani Taliban, which now operates from sanctuaries in Afghanistan. Pakistan launched a military operation in 2014 to clear the Federally Administered Tribal Areas of insurgents, including the Pakistani Taliban, many of whom escaped across the border into Afghanistan. Pakistan, however, is reluctant to please the United States, which it considers a distant and fickle ally, by moving against the leadership of the Afghan Taliban. The United States, for its part, regards Pakistan as a duplicitous partner that is willing to take U.S. funds but unwilling to cut ties with militant groups or eject Afghan Taliban leaders, particularly those affiliated with the Haqqani network, a Pakistan-based faction that has orchestrated high-profile attacks in Afghanistan, particularly in Kabul. Pakistan also has its own leverage against the United States. Islamabad could, for instance, threaten to cut off the United States’ air- and ground-based supply routes to Afghanistan. That leverage has been diminished somewhat in recent years, both by Washington’s reduction of U.S. troop levels in Afghanistan (thereby lessening its need for supplies) and by the proven efficacy of the Northern Distribution Network (NDN), which moves supplies through Russia and Central Asia. In 2011, for example, when Pakistan closed its ground routes to the United States, the NDN allowed the International Security Assistance Force commander, General John Allen, to store nearly six months of reserve supplies inside Afghanistan. Yet Pakistan’s ability to threaten U.S. logistics is still formidable: in 2015, Russia shut down the NDN, and there is always a chance that Moscow could decide to play hardball if the United States sought to reopen it. In 2014, the United States lost the use of its Manas airbase in Kyrgyzstan, the last U.S. base in Central Asia, as the Kyrgyz government sought to win favor with Russia. Another option is for the United States to use an Iranian land route moving through the port of Chabahar, but this is likely off the table given the heightened war of words between the Trump administration and Tehran. Depriving the United States of its air routes into Afghanistan, moreover, would end Washington’s ability to conduct air support with Gulf-based fighters and bombers. The current standoff is further complicated by this year’s electoral calendar. The United States faces midterm elections in November, Pakistan has a parliamentary election in June, and Afghanistan has one in July. India, too, might bring forward its elections, currently scheduled for 2019, to this year. In all of these countries, then, domestic politics will dominate decision-making for the foreseeable future. Pakistani Foreign Minister Khwaja Asif’s belligerent, rapidfire Urdu tweets on the U.S. sanctions, which pronounced the death of the alliance, are a good illustration of how this domestic focus could make compromise with the United States difficult. Trump, meanwhile, is anxious to show that the United States is winning in Afghanistan, which might lead him to increase pressure on Pakistan by imposing additional sanctions. (As strategic thinker Harlan Ullman’s recent book Anatomy of Failure maintains, the United States has never won a war that it started.) Meanwhile, Afghanistan and India could support U.S. attempts to influence Islamabad. This would in turn fortify Pakistan’s perception of an international conspiracy against it. A final obstacle in getting Pakistan to change its policy is the fact that it currently has an ersatz government run by a competent, albeit weak, prime minister, Shahid Khaqan Abbasi. Abbasi has no political clout within his party, the Pakistan Muslim League-Nawaz, which still bears the name of former Prime Minister Nawaz Sharif, who was forced to step down over corruption allegations in July but continues to call the shots. Dynastic politics in Pakistan weaken civilian governance and democratic legitimacy, allowing the wellorganized military to dominate policymaking and take a strong position against U.S. demands. Since 2001, moreover, the United States has tied itself to successive unpopular, autocratic, and corrupt administrations in Pakistan, including that of the dictator Pervez Musharraf. In doing so, it has failed to build a relationship with the 200 million people of Pakistan, a majority of whom, even at the height of the Afghanistan war and U.S. drone strikes on their country, wished to have better relations with the United States. Against this backdrop, it is unlikely that threats to cut off U.S. funding—or Trump’s inflammatory tweets—will have much effect in terms of changing Pakistan’s behavior. Rather, they will only inflame tensions between the two and worsen the situation in Pakistan. After all, the last time that such a break in ties took place was in the 1990s, in the wake of Pakistan’s development of a nuclear weapon and the United States’ withdrawal from the Afghan theater following the end of the Soviet occupation. Pakistan was left to cope with the aftershocks of the Afghan war on its own. The United States also stopped all U.S.-based training programs for Pakistani military officers, beginning with the Pressler Amendment in 1985 and lasting through the 1990s. This “lost generation” was deprived of contact with its American counterparts, leading Pakistani officers to develop a view of the United States as an untrustworthy ally. Yet today, more than 200 of the brightest Pakistani officers come to the United States for training purposes every year. If the U.S.-Pakistani relations continue to deteriorate, this training program may disappear again. Indeed, the current public contretemps will likely produce a train wreck for the U.S.-Pakistani relationship unless meaningful dialogue resumes. It is important that the discussions between the two be led by diplomats, rather than politicians, so that solutions can be found that build on the two countries’ dependence on one another and serve both of their interests. It is important, moreover, for Washington to inform and engage with the people of Pakistan in these exchanges. Washington is right to favor results-based assistance. Why not let Pakistan set attainable targets for aid, and agree with the United States on these before aid is disbursed, rather than quibble over reimbursements, as is the case now? The United States, meanwhile, could use its influence with India and Afghanistan to develop a more sustainable, long-term regional plan to fight terrorism and militancy. If Trump can pull this off, he can declare victory before exiting Afghanistan. If not, the current dispute could portend a messy defeat. As President Barack Obama prepares to address the Muslim World from Cairo on Thursday this week, he would do well not to dwell on the past but to look to the future. His speech should be the first salvo in a battle to meet the expectations of a world dominated by youth. He should not revive memories of past conflicts. He needs to keep certain facts in mind, many of them intuitively clear to him no doubt from his own exposure to parts of the Muslim World and to his early personal friendships with young Muslims. First, Muslims, who comprise between one-fifth and one-quarter of the world’s population, are a diverse lot. Speaking politically or socially of the “Muslim World” as a bloc would be a mistake, as much as speaking of left-handed persons in the world as a bloc. Second, their population is rising rapidly, close to 2 per cent a year worldwide. In the last century the world’s Muslim population rose from 150 million to over 1.2 billion. Most important, President Obama will be addressing a population with a huge “youth bulge”: In the Middle East, for example, 60 per cent of the population is below 25 years. Research indicates that some 60 of the 67 countries with a youth bulge are embroiled in internal conflicts today. In 62 countries of the world, two-thirds of the population is below 30. Countries like Nigeria, Afghanistan, and Pakistan are included in this group. Over half of the population of Iran is below 30 years. Muslim youth were excited by Obama’s election and it is this group that he should address when he speaks from Cairo on June 4, for they, not the aging autocrats or obscurantist clerics, will control the future of the Muslim World. And they are increasingly connected with the world at large through the internet, radio, and television. What is the message they wish to hear? It understands the angst and the anger of the youth of the Muslim World and supports them in their quest to stay true to their Muslim roots while reaching for the fruits of democracy and progress that youth around the globe seek. If President Obama connects with Muslim youth this week he will be investing in the future by drawing them away from the blandishments of the radical Mullahs. If he bends his message to maintaining ties with the antiquated feudal and dynastic leaders of the Muslim World, the opportunity will be lost to build a better world for all of us. PROVINCIAL authorities in the Swat Valley in northwestern Pakistan struck a peace deal with local Taliban franchisees this week, and in it the government agreed to extend Islamic law in the area. Since then, commentators around the world have pretended to know what the agreement means. Some suspect a "hidden hand," whether it be the intelligence agencies or the United States. In a conspiracy-prone Pakistan, some even talk of an inside deal between the army and the militants – even as they ignore the hundreds of casualties that the army suffered in Swat. Never mind that facts may interfere with these pet theories. "For months and months the military has been trying to quell the militants. Two days ago their failure was accepted when the provincial government of the North-West Frontier Province went into talks with Mullah Sufi Mohammad and accepted some things. We don’t yet know what those things are but the first promise is peace. Peace on what grounds? We don’t know. "We no longer can turn [to anyone] here to complain. We now have to think about how to survive this. We now have to give up much of what many of us believe in – tolerance, peace, educated women, and freedom." She believes the North-West Frontier Province is lost. And she questioned whether President Obama understands the extremists. "He seems to think that these people can be contained within their land, or [any] land. He thinks there is a meeting point, a dialogue possibility. Those who think that giving the militants their haven will contain them – well, the rest of the country and the world will see what this will lead to. This is not the end, it is only the beginning." I can see her point. We seem to be reviving a deal that fell apart last year, a deal that the army opposed at that time. It fell apart in a matter of days, and the first army sortie resulted in some 18 dead soldiers. Will the army want to re-enter the fray if this deal falls apart? Who will claim responsibility for the inevitable failure? Recall that in 1994 Prime Minister Benazir Bhutto’s government agreed with the same militant leader, Mullah Sufi Mohammad, to allow him to run some districts of Swat and Malakand according to his convoluted view of Islamic law. He thus got legitimacy and grew into a force that now has brought a new government to the table. Pakistan’s constitution already contains provisions protecting against un-Islamic laws. Why then does the country need an agreement with violent extremists to ensure Islamic laws? And who will pronounce on these laws? The militants? And if the army is to remain in a "reactive" mode, as a government minister explained, will they stand by and watch Taliban justice being meted out to people? Who will ensure that girls’ schools will be rebuilt? Who will protect those who refuse to wear a beard or a burqa? Who will disarm the militants? Certainly not the Taliban. The Swat deal gives territory in Pakistan proper to a militant minority, against the wishes of the majority of Muslims in what was once a valley of peace and quiet. 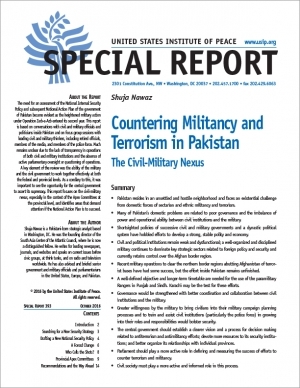 If the militants gain this foothold, the stain of extremism will spread further into Pakistan. My young correspondent may be right: This is not the end, it is only the beginning. 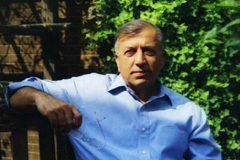 Shuja Nawaz, author of "Crossed Swords: Pakistan, its Army, and the Wars Within," is director of the South Asia Center of the Atlantic Council. During the tumult of 2008, the talk in Washington and in Islamabad turned to the need for the United States to have a relationship with the people of Pakistan rather than with any single leader or party. Indeed, only by garnering the support of a majority of Pakistanis can the United States leap over the yawning mistrust between these two countries and help Pakistan’s government become stable. Two months into 2009, we are waiting for that change to occur. President Obama has rightly focused attention on Pakistan, sending his powerful and highly favored representative Ambassador Richard Holbrooke to take on the difficult job of resolving regional differences and restoring stability to an embattled country. Ambassador Holbrooke will need help from both Washington and Islamabad to get to the roots of regional problems. As our forthcoming Atlantic Council Task Force Report on Pakistan stresses, Washington needs to find a way to provide a healthy dose of financial aid to Pakistan, based on a thorough discussion and agreement with Pakistan on how that aid will be used to improve the lives of people across the country and not just in the borderland near Afghanistan. Call it conditionality or "tough love", it is important to be clear about the objectives of such aid, for the financial climate in the United States will not allow any more blank checks to be issued. On its side, Pakistan has already taken many steps to assure the international financial community that it is ready to get its economic house in order. But much more needs to be done: Improving the tax administration, broadening the tax net to capture agricultural income and capital gains, strengthening the legal system to provide cover for investors, especially from abroad, and removing corruption from the highest levels of government. Too many ministerial appointments to its cabinet (which now has 83 members) are seen by the coalition’s multifarious member parties as cash cows for their party coffers. Pakistan could also end the current "cash-for-hire" scheme under which its army was sent into the Federally Administered Tribal Areas. The U.S. promised to reimburse its "non-NATO ally" for the costs of making this move, and the more than $10 billion in aid given for this purpose is often used as a political stick to beat Pakistan during any discussion of aid to that country. But the U.S. reimbursement scheme barely covers the marginal costs of the army’s entry into FATA, and the political costs for Pakistan have been very high, creating a huge backlash among the population of the region as well in the rest of Pakistan. Inside the Pakistan army there is simmering resentment at all levels about the manner in which the military aid and reimbursements are handled. It would in the interest of both countries to end this scheme, and for Pakistan to truly take on the war against militancy as its own war. Then, if the U.S. is serious about helping Pakistan, it would do so by meeting Pakistan’s needs for financial aid and equipment (including helicopters and training). Let Pakistan do its own job, for its own sake, not because the U.S. pays it to do so. U.S. drone attacks inside Pakistan are a source of great unhappiness inside Pakistan. The United States needs to find a practicable way of allowing Pakistan to manage the drone operations and to take the lead in identifying and attacking militant targets inside its borders. Fears about transferring sensitive technology to Pakistan could be addressed by joint operations of drones from Pakistani bases. U.S. and Pakistani handlers could "fly" the drones carrying Pakistani markings and be responsible jointly for their upkeep. If Pakistanis call the shots on final actions against foreign militants and eliminate or limit collateral civilian damage, then they will truly be fighting their own war and not "America’s War." On the regional level, Pakistan can and should play a greater role in helping Afghanistan rebuild its military institutions. Increasing collaboration between the two armies would lead to joint operations against the insurgents, while removing the mistrust that has kept Afghans and Pakistanis from working with each other. For example, Afghanistan needs to rebuild its air force something that Pakistan has experience with: it has helped launch a number of air forces in the region. It could become a partner of the United States in speeding up the re-creation of the Afghan air force. Not only would the training be faster and cheaper than with US help alone but also the longer-term effects of close cooperation could lead to mutually understood practices and combined operations. Over time even Indian involvement in this effort could become feasible; both India and Pakistan once assisted Sri Lanka, during the early days of its insurgency. While the Obama administration seeks to re-energize the engagement with Afghanistan and Pakistan, it will need to find new ways of making friends and helping reduce regional animosities. Throwing money at problems is one way. Changing peoples’ minds about each other may be a better way of achieving peace and stability in that region. Charles Dickens called Washington a “city of magnificent intentions.” When Barack Obama takes over on January 20th as the 44th President of the United States, he will need to translate his own lofty ideas into realities. What makes the challenge bigger for him is that he may also be carrying another title: the first globally-elected President of the United States. Unlike any other presidential election in US history, his nomination was favored by denizens of over 90 countries worldwide. All his supporters, here and abroad, expect him to transform the image and reality of the United States, in short order. While this is a daunting task, it also offers him a grand opportunity to make some bold decisions and set the United States and its partners on a fresh path, where an engaged and principled US foreign policy based on humanity and justice would be the rule. Expectations are high and no where more than in the Muslim World that has seen the past decade marked by a threatened Clash of Civilizations between it and the West. That is also where the most dangerous shoals of foreign policy exist: Gaza, Iraq, Afghanistan, and South Asia, particularly Pakistan, which may be his greatest nightmare. President Obama will not have much time to tackle each and all of these regions of unrest before he runs out of the hope and goodwill that will support him in his early days in office. The economic detritus of the Bush Administration has made the transition complex and difficult. But certain principles that are already reflected in some of his public statements may help point to likely actions that will allow him to make some historic leaps and take his supporters and doubters both with him. Let the Muslim World understand loud and clear that the United States has no designs against it and that it will practice what it preaches by not supporting dictators and autocrats against the freedom-seeking people of the Muslim World. President Obama can make this statement more effective by choosing to deliver his major foreign policy speech abroad, preferably in the Muslim World…then see the wave of support carry him over the obstacles to these Grand Objectives. Where would be a good venue for this event? How about the Wagah border crossing between India and Pakistan, so both Indian and Pakistani crowds can see and hear him? And let those metal gates that are shut by goose-stepping soldiers every evening remain open forever after that as a symbol of good neighborhood and out of respect for a brave new U.S. president who is unafraid to tackle the hardest tasks first. This piece also appeared on The Huffington Post and on the Atlantic Council website www.acus.org, where the author is now Director, South Asia Center.